It was a very rainy night a few weeks back in Montreal. After a long day of moving my daughter out of her university residence, we’d walked from Pine Avenue trying to figure out where to go for dinner. 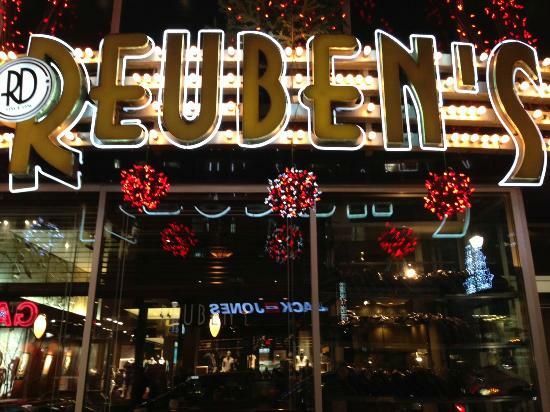 We were tired and getting wetter and colder when there in the next block we spotted Reubens, a long time favourite of ours. Walking into the restaurant, you are greeted with the traditional deli display of enormous slices of cheesecake, carrot cake and Black Forest cake. 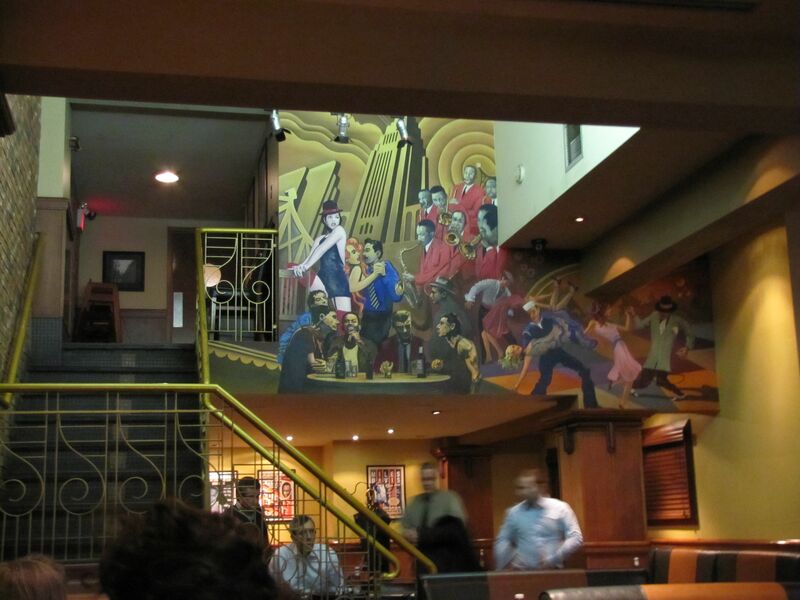 The back wall features a bright and cheerful mural over a space that can accommodate a group dinner. Although it is considered a steakhouse, the atmosphere is casual and unrushed. My eyes continue to grow big from hunger and reviewing the menu is worth considering. The standard too many pages of items – that is, smoked meat done more ways than you can count, in pizza, salads and massive sandwiches and of course a wide choice of steaks. Given the level of our hunger, we order items that we know have a quick turnaround from the kitchen. I have the Famous Super Sandwich, 10 ounces of smoked meat piled high with a kosher pickle and fries. My daughter orders the Classic Cheese burger and we share a slice of Red Velvet cake. The wait staff is attentive, orders are taken quickly and food arrives hot without a long wait. It’s about 8:30 p.m and it’s the time Montrealers start to get out to eat. As my blood sugar starts to get back to normal and I dry off from the rain, the warm atmosphere of the deli is a comforting reminder of my simple student life in the city. The restaurant is now getting full as we leave. The staff goes to the door to show you out and wishes you a good night. A stop well worth making if you’re on Ste. Catharine street and don’t know where to go. Good deli food done the Montreal way. Happy Eating!